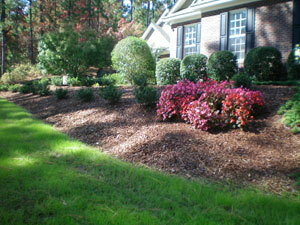 McCrimmon Landscaping & Grading; Residential and Farm Fencing in Southern Pines - Pinehurst NC. FENCING from McCrimmon Landscaping & Grading Inc.
Do you need your yard fenced in to protect your children or to constrain your family dog? Are you setting up a horse farm in central NC's horse country? If so, McCrimmon Landscaping & Grading is your source for beautiful and professional fencing in the Southern Pines / Pinehurst NC area. To complete each project, traditional Mile Away Estate Gates are hand constructed & hung as well as other preferred gates. To insure stability, we use concrete in all our posts as needed. Precision is key to completing a fencing project and we take pride in all of our work. Contact our professionals at McCrimmon Landscaping & Grading, Inc. today for an estimate on your fencing needs!